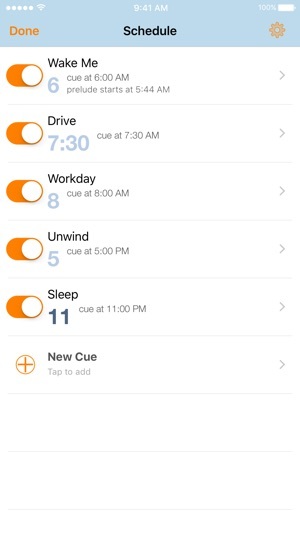 With Cue Up, you can wake up to your favorite music, and set musical or spoken prompts to help you schedule your day. You can also create a transition in your music for before your alarm goes off so you know when it's coming. 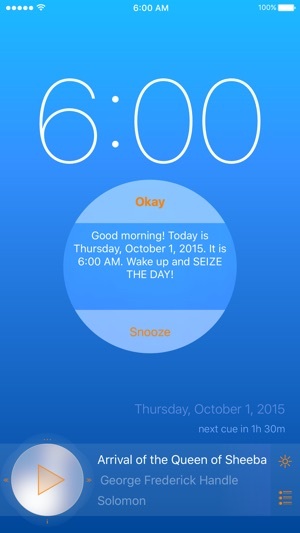 Then you can set your favorite music and a spoken message to crank up when it’s time to wake and get going. We think it’s an especially great way to start your day. 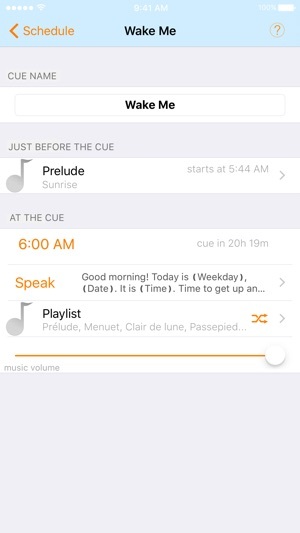 Cue Up allows you to create custom playlists scheduled by the time of day. That’s neat. But it also adds two simple things to these scheduled musical cues that we are excited about: a prelude and a custom spoken cue. The prelude in Cue Up is a playlist that plays just before the cue. It finishes when it’s time for the cue, right before the next scheduled playlist starts. What’s special about that? Ever watch a movie and known that something was about to happen because the music changed? The prelude can provide an audio prompt that a cue is about to happen before it actually does. We love playing a few select songs each morning just before it’s time to get up. We feel this helps us prepare to wake. 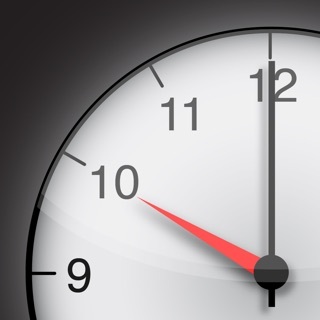 And if you are awake, it lets you know that it’s almost time to get going without needing to even open your eyes, almost a pre-snooze. 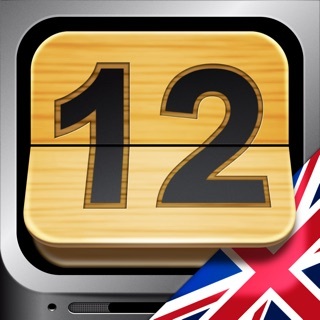 The prelude can also be used as a time to gradually turn up the music volume (which can be set for each cue in the schedule) and gradually brighten the display if the app has been in night mode. The prelude can ease you into your cue. You can also set a custom message to be spoken at the cue time. 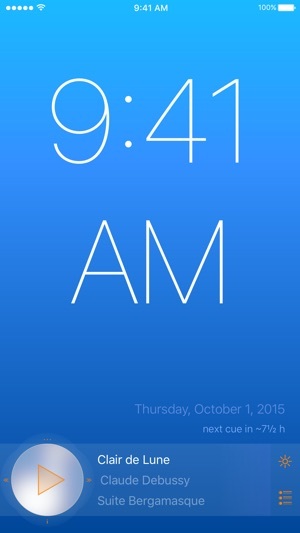 It lets you include the time, day, and date, and will automatically update these. This allows cues like: “Good Morning! Today is Friday and it is 6:00 AM. It’s time to wake up and seize this day!”—whatever inspires you! Build your playlists selecting entire albums, playlists, or even genres with a single tap. And these are ‘smart’ additions. If you add a genre to a Cue Up playlist, as you add or remove songs on your device tagged with that genre, the cue playlist will be automatically updated. Feel in the mood for something a little different? Slide the play control up to bring up Now Playing and make changes on the fly without affecting your schedule. Slide the play control to the right or left to skip forward or back. Slide down to toggle showing the track information. Tap the play control to play/pause. Tap the sunrise to toggle the app’s night mode. From night mode, Cue Up will gradually brighten the display during the next prelude. Cue Up will also allow many other music apps to stream music until it’s time for your next cue, when Cue Up can kick in to cue you. 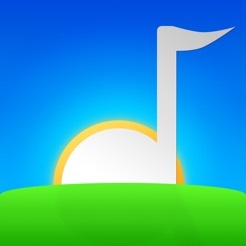 Start the music in the other app, then switch to Cue Up (make sure that the device is charging, the Cue Up setting to keep your device awake is selected, and Cue Up is open). Cue Up — Set a rhythm to your day. Cue Up only adjusts its playback volume; it does not adjust the device volume. If the device volume is muted you will not hear audio from Cue Up. Cue Up can play music that is on your device (except when it can’t—such as when it’s blocked by DRM). It can play in the background, and it will cue on schedule from the background as long as Cue Up continues to play. If you don’t want cues, stop the music and close the app. We hope you love it! Let us know what you think! Visit our website at theappenginethatcould.com to see more about using the app, including tips and tricks. Way better than an alarm! Why haven’t I found something like this years ago! This is a great way to get me up in the morning. After a few mornings, I find I far prefer a voice, and I’m actually listening to my own music! Note that you have to either play music all night (which I’ve been kinda liking softly in the background) or keep the phone charging and the app open (there’s a setting to keep the device awake that you need to choose). Great alarm or schedule keeper! 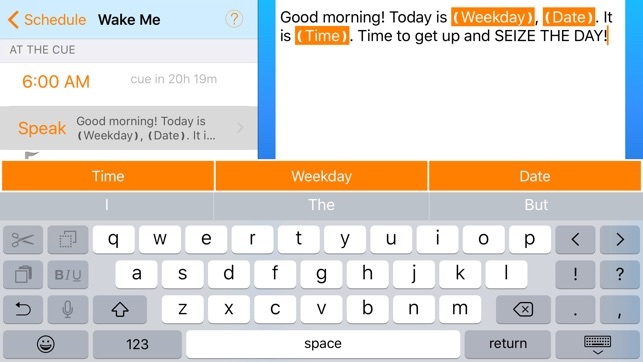 Waking to your own music is much more pleasant than a typical alarm, and this app also can be used to remind you of your schedule throughout the day. It accesses your playlist for music, and you can also type in phrases for it to speak at times you set. Useful tool, easy to use! When I need an alarm, this is the way to go. It’s really easy to setup an alarm using whatever song you want. 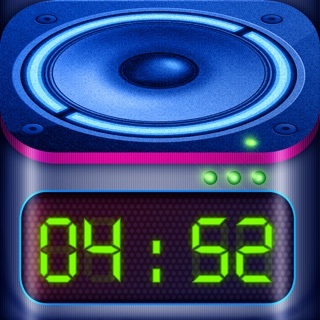 I love that I can now choose exactly what song I want to wake up to…no more annoying beeps and tones!